A 90-day health and energy transformation for women with an underactive Thyroid or Hashimoto's disease. Watch the launch webinar now! A 90-day health and energy transformation journey for women with an underactive Thyroid or Hashimoto's disease. Be Empowered To Transform Your Habits And Rescue Your Thyroid Health FOR LIFE! This step-by-step program will take you through the 4 essential phases needed to heal and optimize your Thyroid function. Developed through hundreds of hours of research and $1000s of testing, it's a proven method for improving your health! Discover the personal power and freedoms that come with eating "right". Used to help countless others, our approach is guaranteed to reduce inflammation, improve your Thyroid labs, increase energy, stabilize your weight, and minimize digestive discomfort. Designed to take less than 30min to prepare (even for kitchen novices!) and feed you for multiple meals. Discover the joys of new tastes and eating real foods, knowing all the while that your Thyroid health is on the mend. Never be confused again about the kinds of foods that trigger allergies and immune reactions in your body. With our unique Reintroduction protocol, you'll gradually discover the best diet for your body and gain complete clarity around the foods that work best for you. Adjustable for singles, couples and families, these checklists will take the stress out of shopping trips. Spend your valuable time on more important things than randomly wandering the aisles. Everyone needs help and advice when tackling new challenges but true experts are out of reach for most people. With 4x monthly consultations with Nat, your personal approach can be tailored to accelerate your results. Never be stuck with an unanswered question! Tune in from the comfort of your home and ask any burning questions that are holding you back from greater health. For those weeks where life gets in the way, catch-up on the recording at your convenience. Following your Initial Discvoery Call, you'll be setup with a personal account and access to the highest-grade supplements available for your needs. These form an essential part of your healing strategy and are available at discounted rates to help you recover faster. To heal your Thyroid and change your life, having the right information isn't enough- you need an environment of support. Join a group of determined women striving for better quality of life and share your breakthroughs daily. You'll never feel isolated or like nobody "gets it" again- we're in this together! After a full Thyroid blood test panel (included in the program), we'll have all the data available to truly understand what's wrong with your Thyroid. With a trained eye, Natalie can quickly and professionally make assessments and recommendations on your optimal treatment path. As a valued member of the Thyroid Rescue Tribe, you'll be the first to know of special events and opportunities to network with Natalie and her team as they take their mission to the World. With your personalized login, access Thyroid Rescue from any mobile or desktop device from anywhere, anytime. Learn at your own pace with a format that suits you- professional MP3 recordings, transcripts and worksheets. Discover a new way to think and reprogram your mind that will leave you feeling totally transformed. With newfound focus, determination and energy you'll be fully-equipped to make changes to your habits, routines and thought patterns. Redo or review your favorite parts of the program whenever and wherever you like! All students retain lifetime access to Thyroid Rescue, including the online course content and Community Support Group. We provide regular updates and upgrades to keep our treatments in line with best practices. Thyroid Rescue has been expertly crafted to provide students with an immersive, transformative environment. You'll thrive and succeed alongside other equally motivated women and celebrate your wins together, all the way from start to finish! Women with an underactive Thyroid, plain and simple! In some women this takes the form of an autoimmune condition (Hashimoto’s disease), where your body is actually attacking the Thyroid. In other women it can simply be underactive or “sluggish”, known as Hypothyroidism. In both cases the treatment is very similar, and our Thyroid Rescue program will provide you with a dramatic health transformation. Many women also have all the symptoms but have never received an official diagnosis from their GP. Thyroid Rescue provides you with comprehensive blood tests to help you truly understand what’s happening with your Thyroid. The power of our program is that it’s not another information product; Thyroid Rescue is an experience. You’ll be taking life-changing steps alongside other motivated women, sharing your progress and growing toward your healthiest self. Thyroid Rescue has been strategically designed to help you achieve a continuous series of “small wins” that will radically transform your health and mindset forever. How much time/effort will it take to complete this program? As with anything in life, the more you put in the more you’ll get out! Clients who keep up-to-date with course content as it’s released, follow the provided meal plans, attend the weekly webinars and actively participate in the Community Support Group will get the best results. You should allow around 2-3hrs per week to go through the education and action steps. However, we understand that everybody has different schedules so Thyroid Rescue also allows students to “go at your own pace”. All students have lifetime access to the course, including all future updates for FREE, so there’s no time pressure to finish by a certain date. Thyroid Rescue is the only guide you’ll ever need to achieve great Thyroid health for life. How long will it be before I start getting results? I'm not sure if I have a Thyroid issue- how can I be sure this is going to help me? See that little orange arrow at the bottom of the screen? Good! Click that and enter your email address to take my FREE Thyroid Symptom Checker Quiz. Just answer the survey that will be sent to your inbox and within 5 minutes you’ll know whether this is for you! If your symptoms feel like they’re getting worse then we recommend you retake the test as a way of self-monitoring your Thyroid Health. I already know I have Hypothyroidism- is this course for me? Absolutely! In fact, you’re one of the main reasons we created this course. In our experience, most sufferers of Hypothyroidism have been ‘living’ with their condition for many years. Generally this is nothing more than surface-level, symptom management. Thyroid Rescue has been designed primarily to get suffering women get back on the right path toward optimal Thyroid treatment and health. Can I do this program if I currently follow a vegan, vegetarian or pescatarian diet? Nat’s personal food philosophy, her client’s results from clinical practice, and the most current research all support a plant-based diet (about 80%) with small amounts of animal-based foods (about 20%) as optimal for the treatment of an underactive Thyroid. Hence the Thyroid Rescue meal plans are structured in this manner to get you back to optimal Thyroid health as quickly as possible. If you’re currently vegan, vegetarian or pescatarian, you’ll still find huge benefit from doing the program as there are MANY factors beyond just diet that impact your Thyroid health. These include things like sleep, stress, mindset, detoxification of your home, infections/overgrowths, dental triggers and nutrient deficiencies. Please feel free to reach out to our support team if you have any further questions on this. If my Thyroid has been removed or radiated will this program still benefit me? Yes! If you’ve had your Thyroid removed or radiated then you will currently be on Thyroid hormone replacement therapy (Thyroid medication). However, there are MANY factors that influence whether the Thyroid hormone you’re taking is actually getting into your cells and doing its job properly. The program also addresses many other systems in the body that cause symptoms of an underactive Thyroid, such as weight gain, lack of energy, brain fog, digestive distress, hormonal irregularities and so on. By doing the program you’ll see improvement in many of these areas, even without a Thyroid. Please note that this program is NOT a replacement for your medication and it’s important that you continue taking it and working with your healthcare provider. I've already had my Thyroid tested and my doctor said it's normal. Will I still benefit from the program? It sure is, and if we had a dollar for every patient that has been told their Thyroid is “normal” when it actually isn’t, we would be loaded! Unfortunately, the reference ranges for “normal” Thyroid function are very large and in our experience grossly off. Therefore your blood test may look “normal”, but that doesn’t mean that they are optimal, nor does it mean you are symptom-free. And that’s our goal- to help you feel the best you can! The other consideration is that many doctors will only order ‘TSH”, or ‘TSH and free T4″ if you’re lucky. This is only one or two of about 6 markers that tell us how your Thyroid is doing. In our opinion, you need to get ALL 6 markers tested AND consider your symptoms, which is exactly what Thyroid Rescue has been designed to do. Don’t suffer in silence if your “gut feeling” (literally) is telling you that something isn’t right. My doctor won't order the suggested tests so can I order them elsewhere? We know that most GPs are generally not willing to order more than a standard TSH blood test before making a diagnosis. That’s why we’ve developed a relationship with a private pathology network that will allow you to access ALL the tests needed to truly understand what’s wrong with your Thyroid. One complete test is included in the program, along with instructions on how to re-order this whenever you need to. Are there any hidden costs or obligations? The program contains everything you need to dramatically transform your energy and Thyroid health in 90 days. Supplement recommendations to speed up your healing journey are offered within the program, and based on the severity of your individual symptoms, blood test results and personal health history these may be more needed by some than others. However, there are absolutely no obligations to purchase additional treatment options/ testing/ supplements/ support if you don’t wish to. The meal plans don’t require any fancy or exotic foods, though we do encourage you to focus on the quality of your food sources. In some cases this means we recommend purchasing the “organic” option, which can be more expensive when purchased through retail food outlets. Tips on how to source more cost-effective, high quality food will also be provided in the support group. Will my family be able to eat the same foods as me if I do this? If the answer is yes, then absolutely! 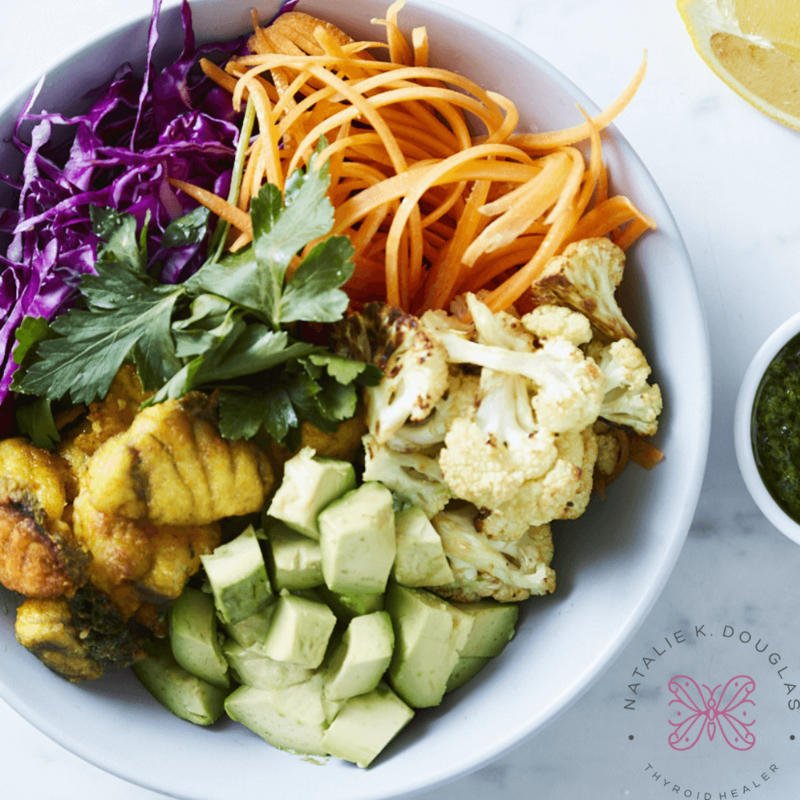 We can promise that the recipes are nutrient-dense, real foods, filled with flavour and variety. They’re all recipes that many of my family and client’s families enjoy on a regular basis; so far we haven’t had any complaints! We’re also more than happy to help out with ingredient swaps when possible if there’s a certain food that you or your family don’t like. What if I have a FODMAP sensitivity? Where possible, we’ve given a low FODMAP alternative to the recipes and we’re more than happy to provide additional swaps and suggestions for you along the way. The even better news is that during this program Nat will personally assess your gut and help address any gut imbalances that are contributing to your sensitivities. They sure are! All meal plans are gluten, dairy, sugar, soy and processed food free. We also guide you through a Thyroid diet elimination protocol. Any potentially problematic foods will be identified and temporarily removed to help your body heal before slowly reintroducing them. I don't have Facebook, can I still do the program? Absolutely! 100% of the teaching content and meal plans will be available via a private online platform. However, you won’t be able to access the weekly live Facebook webinars or the support group. So we encourage all students to create a Facebook account for this sole reason, even if you never use Facebook for anything else! I live outside Australia/New Zealand. Will this program help me? Due to the complex and diverse nature of health care systems, Thyroid Rescue has been specifically designed for residents of Australia and New Zealand only. International clients can still contact Natalie for 1-1 consultations to get your Thyroid health back on track! I'm currently pregnant or breastfeeding. Is it safe for me to do the program? Thyroid health during pregnancy requires special attention. We recommend that if you’re pregnant you work with Natalie 1-1 instead of doing the program. If you’re breastfeeding then the program is definitely safe for you. However, you must let us know that you’re breastfeeding as some of the optional supplements will not be suitable for you. What happens if I get too busy and miss a webinar or "fall behind"? We totally get that life can get hectic at times, and have designed Thyroid Rescue to be a “go-at-your-own-pace” experience. All the weekly live webinars will be recorded and made available for replay within our Private Facebook Group. Will you prescribe medications or change my current dosages? No, we don’t have the authority to make these changes. However, based on your individual circumstance we can provide written recommendations (with accompanying blood test results) for you to discuss with your GP or specialist. We’ll also provide recommendations on how to find a good GP or specialist to work with and how to discuss optimizing your medication. Do you have a question that wasn’t answered in the FAQ section above? Send us an email via hello@nataliekdouglas.com or drop us your question below!